The preservation, display and documentation of the history of Chinese characters can now be assured with the National Museum of Chinese Written Language in Anyang, central Henan Province, opening its doors on Monday. Anyang is home to the ancient oracle bone scripts, or Jiaguwen, the earliest record of ancient Chinese characters, written on animal bones and turtle shells. The scripts are direct ancestors of modern Chinese writing and are considered as key relics in the study of Chinese etymology. "The significance of Chinese language and characters is increasing as China plays a growing important role in international society," Li Changchun, member of the Standing Committee of the Political Bureau of the Communist Party of China Central Committee, was quoted on the museum's website as saying. "The establishment of the National Museum of Chinese Written Language is essential in spreading Chinese culture and reinforcing the dignity of the Chinese people," Li added. The opening ceremony attracted politicians, scholars and historians, all keen to take a first-hand look at the significant and never-before seen collection of relics. "The museum will preserve the profound cultural heritage of Chinese characters. Through modern ways of presentation, it will allow people to understand the enormous changes in Chinese history and help to revive the importance of traditional Chinese culture," said Wang Wenzhang, vice minister of culture, speaking at the museum's opening ceremony yesterday. 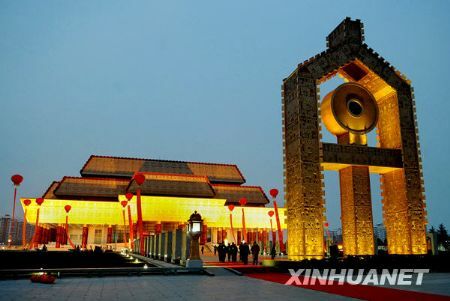 According to Xinhua, the museum, with an initial investment of 400 million yuan (US$58 million), covers an area of 54,000 square meters. A combination of the old and new, the building has drawn inspiration from palaces of the Shang Dynasty (1600-1100BC) and post-modern architecture. The five-story facility has a striking embossed golden roof and grand red columns. China's only museum dedicated to characters on national level, the institution has an extensive collection of over 4,000 pieces, 305 of them classified as first-class relics. Divided into eight exhibition halls, the museum illustrates the history and evolution of Chinese characters through different dynasties and various ethnic groups in China. As part of the opening exhibition, 764 pieces are on display, including the important oracle bone scripts. Bronze vessels, Chinese seals, ancient coins, bamboo, silk and calligraphy from different dynasties are also being showcased. A total of 16 borrowed pieces are highlights of the exhibition. One of the most prominent pieces on show is the Simuwu Ding, a four-legged bronze ritual vessel from the late Shang Dynasty that was excavated in Anyang in 1939. The precious artifact weighs 875 kilograms and reveals previously unknown clues to unveiling technology, design and production techniques of ancient times. It is the largest bronze relic ever to be unearthed in China. The global premiere of 4-D film "The Oracle Bone Script" was also part of yesterday's opening celebrations alongside the first Chinese character development forum and the launch of a special series of stamps. Ensuring that ancient scripts are accessible to modern visitors, many attractive, interactive and technologically advanced exhibits are part of the new facility. Visitors to the museum can enjoy playing with words via a variety of programs including word riddles, business card design, digital character games and 4-D cinema. Prior to the opening of the museum, curators searched the globe for pieces to enhance their collection. A precious calligraphy presentation of 80 works provided by Beijing's Palace Museum, which includes originals by masters such as Wang Xizhi, Ouyang Xun and Yan Zhenqing, adds to the context and significance of the opening exhibition. A collection of 56 works has been contributed by the Archaeological Institute of the Chinese Academy of Social Sciences, 30 items are pieces of oracle bone script, the others are bronze ves-sels from the Shang Dynasty. Despite the outside additions, Li Hongwei, Anyang's vice-mayor, was quoted by Xinhua as saying that procuring relics was a difficult task. He said that not many universities or libraries outside the national relic system had been supportive and that expenses regarding borrowed items still have to be resolved. "Relic soliciting is a long-term mission. We'll continue working on that after the opening," Li stated.